15 Mike Brown (Harlequins 65 caps), 14 Anthony Watson (Bath Rugby 29 caps), 13 Jonathan Joseph (Bath Rugby 36 caps), 12 Owen Farrell (Saracens 54 caps), 11 Jonny May (Leicester Tigers 30 caps), 10 George Ford (Leicester Tigers 41 caps), 9 Danny Care (Harlequins 77 caps), 1 Mako Vunipola (Saracens 45 caps), 2 Dylan Hartley (Northampton Saints 90 caps), 3 Dan Cole (Leicester Tigers 78 caps), 4 Joe Launchbury (Wasps 48 caps), 5 Maro Itoje (Saracens 15 caps), 6 Courtney Lawes (Northampton Saints 62 caps), 7 Chris Robshaw (Harlequins 60 caps), 8 Sam Simmonds (Exeter Chiefs 4 caps). 16 Jamie George (Saracens 21 caps), 17 Alec Hepburn (Exeter Chiefs 1 cap), 18 Harry Williams (Exeter Chiefs 6 caps), 19 George Kruis (Saracens 22 caps), 20 Sam Underhill (Bath Rugby 4 caps), 21 Richard Wigglesworth (Saracens 27 caps), 22 Ben Te’o (Worcester Warriors 9 caps), 23 Jack Nowell (Exeter Chiefs 24 caps). Im really interested to see how rubbish Mike Brown needs to get to not get picked. Edited 1 time(s). Last edit at 08/02/2018 10:13 by woodpecker. Woody, bit of a cheap shot to put the 'w' in Wales as lower case. However, we need to win and that's as good a team to do it. Have to say I'm a bit worried about Patchell though I think he will be under far more pressure than last week! "Im really interested to see how rubbish Mike Brown needs to get to not get picked." In fairness - and I don't have any great interest in being fair to Mike Brown, because i'd have dropped him years ago - he came in a bit rusty last week, and will very likely be less rubbish this Saturday. How you can be as good an all-round footballer as Jack Nowell and still see Mike Brown ahead of you is a million miles beyond me. So will their entire back-row. Phenomenal skill level required for that, wp. Catch ball, pass ball. If only that was a skill that thousands of Mini/Junior rugby coaches up and down the country were trying to pass on! I am a little surprised given that I think England looked a lot better when Watson moved to 15 and Nowell came on and played well. I suppose in Eddie's reckoning though is that Watson is such an excellent finisher that I am not sure whether we would have got his two tries last week if he had been at 15 and Nowell on the wing. Nowell for as good as he is doesn't have the same top speed of Watson and you'd then have Watson hitting dummy lines which was essentially Brown's role in several 1st phase moves which seems a waste! By keeping Watson on the wing and moving the ball as they did last week he's hoping he will still get plenty of ball out there and give him opportunities to score as he did last weekend. For as flashy a backline as England could put out you do still need a grunter who is willing to take a hard line into traffic or be missed out in moves which Brown does do to be fair. I think we have to keep Wales honest. They have a few players, like Evans and the open-side, who need to be put under real pressure. Play it tight for the first 20 and kick to the corners. Wales will want it loose. Agree with you Gaz - honest grafters are for the Championship or filthy January afternoons. At the elite level surely you want elite level skill? I don't see anything that Brown can do that Nowell can't. Well let's be fair, Brown is still an elite professional player. He's just not as "flashy" as Nowell or Watson or Solomona etc who are more highlight reel players! He's still far more than a blunt instrument and he does the basics very well. EJ I suspect likes him more because of his mental fortitude than his physical capabilities at times. He's also the only player above like 26 in that England backline so brings experience at this period whilst a lot of the others are still growing into international rugby - albeit only to a certain degree now as I appreciate a lot of them now have 30 plus caps!! Hang on... Did you just call Nowell a flashy highlights-reel player? Anyone else feel there is too much chat coming from Eddie in the build up of this game? It's getting a little ridiculous. It is better than when Johnson was coach. He is a funny guy in commentary but got the media stuff totally wrong. EJ plays the game well and keeps it fun. Gatland is a little more touchy. Wales had the best reaction, just laugh it off. He has been superb for England in the past but I don’t see that now. Still good but could you see him anywhere near the All Blacks side whereas most of our players, whilst not first choice selections, wouldn’t be too far away. Billix, so that's why I ain't had the call from Eddie, time I guess to get boots out from depths of garage and into the bin! I think EJ's concept and use of finishers is the best thing he has brought to England. Games are often won in the final 15 minutes and certain players are better when there is more space. Nowell would be a good example. Just look at England's last two games against Italy. Way to overstate things CB! The term 'finishers' is nothing more than a bit of psychology on Eddie's part to make subs feel better about themselves. Not a single player has been picked for their specific ability in the last 15 minutes of a game. They've been picked because they are the best mix of cover for all eventualities, and they are the next cabs off the rank. If Eddie really thought of it as a concept, he'd have picked Wigglesworth to start. All with the potential exception of T'eo who is just so different in style from the person(s) he would replace that it gives another angle (that angle being out to in rather than JJs in to out according to Jamie Roberts this week). Hard to say who is 'better' between those two. Possibly same case with May and Nowell. Sure - but you could just as easily form an argument for starting with Te'o (bash them up) and finishing with Joseph (use his pace against tiring legs). You could just as easily form an argument for starting with Nowell over May. Surely Nowell's renowned 'work-rate' would be better used over 65 minutes and May's deadly finishing in the last 15. Te'o covers both 12 and 13. Nowell covers 13, 14, 15. That was my point, that those two aren’t necessary the next cabs in the rank, just different cabs. Opti, really couldn't see Wigglesworth starting the game, I think that would seriously p... off Care. I disagree. I think that were the rules different about replacements, then George would be the starter and Care might start ahead of Youngs. Wigglesworth is not at the same level as Care, so that argument does not hold. I think that we have only just begun to understand the importance of these finishers and EJ is ahead of his time in this regard. The concept of finishers is limited to highly resourced countries. The cover doesn’t matter that much I think as they can just rejuvenate those on the pitch if, for example, Nowell started. Interesting to see if they carry through with the reduced subs thing that they keep taking about, would mean that the finishers concept would be dead as a dodo. ‘were the rules different about replacements’ - like how, for example. And tell me how the bench would differ personnel-wise if Eddie thought of them as ‘the guys who come on when the starters either tire or get jinjured’. ideally there would be 2 benches; the guys who come on when the starters either get tired or get injured and these guys never come on just to finish off the game, and the other bench who are specialist finishers who come on only if nobody gets injured but its near the end. Edited 1 time(s). Last edit at 09/02/2018 16:00 by woodpecker. Like an OFFensive 15 and a DEEEfencive 15, maybe with a team who specialise in restarts as well? I think that could catch on! Is bringing on half a new team with 20-30mins to go really good for the game? Doesn't it favour the bigger counties too much? Does it mean more injuries when a fresh body hits a tiring one? Does it promote physical bulk over aerobic fitness? How about a system more like Wendyball, where you can have big bench but you can only make 3 (or 4, or 5) substitutions, either tactical or for injury. Good idea, we could build our new stadium about 3,000 miles away and change our name to the Bath 49ers. that way we get Osi Umenyiora's excellent punditry! I guess catching (the restart) might catch on at lease. Totally agree Jayeatman. Under the current laws, i sometimes wonder why England don't just swap 7 players at half-time. In terms of quality, there's virtually no drop-off. With 14 of your team playing no more than 40 minutes, you could have a big net increase in energy level across the course of the match. Even the most impactful of subs can find 15 minutes passing them by, and it's pretty hard to 'leave it all out there' in 15 minutes. I do agree, but in a dull-contact game, you have to allow for injuries too. How about 8 man benches, but only 5 substitutions. Any injury replacements have to sit out the following week. Halfpenny is ruled out with a foot problem. Anscombe comes into 15 with Watkins on the bench. Patchell will take over kicking duties. Talk about pressure now on him! Anyone else feeling a bit nervous about this one? Maybe not that comparable but Patchell has been tearing it up for Scarlets and looked very comfortable last weekend. Hope we win but it's ours to lose and Wales are riding a wave of confidence. BB you're starting to sound like a Bath supporter! I suddenly feel a lot more at home! Yes, I agree about Patchell but Wales have to be dominant up front and I don't see that happening. Patchell won't crumble but overall I think England are better. If Bath can beat Scarlets you have to think England can as I don't think Bath are close to international standard yet. Women's game England 52-0 Wales, see gents thats the way to do it! U20s had a BP win last night too. Not sure why England U20s played Wales U20s in Newcastle - as far away from Wales as you could get. Next home game is a ly Ricoh. Guess they are (quite rightly) spreading them around so more people can experience the games? It's right to spread them around, but play Wales close to Wales (Wuss, Gloucs, Bath) and you'll get some away support. Play it 250+ miles away and you won't. Save Newcastle for when they play Scotland (next season). Why on earth would you care about away support? Better atmosphere for the youngsters to be exposed to, improved gate and bar receipts for the host club to name but 3 reasons. Make it as hard as possible for away support. It's U20s, it development rugby. You tell that to the U20’s. Develop the team but not by making it easier for the oppo. Launch has been very, very good too. Can't help thinking England should have a bigger lead. What is Right Said Fred doing on the pundit panel? Have Eng scored enough with the wind behind us? Next points are pretty vital. Underhill on for a few devastating tackles we hope ! Watson crocked. Of course he is. Lawes misses tackle but Farrell saves his face racing back. "No sprinkles. For every sprinkle I find, I shall kill you." England missing tackles in midfield but what a tackle from Underhill saves a certain try! Wales allowed to lie on the wrong side all afternoon without a single warning. England penalized each time they go on the wrong side. Lawes gets stripped, looks tired as do England! Why do you do this to us England??? Thought Eddie was a bit slow with the subs. Wiggles showing why he was always the wrong choice for the bench. Time to ditch that experiment, did he give one decent pass to his club FH? Were England saved by the Underhill tackle? Absolutely no fizz. England let Anscombe take over. Tackling was dreadful. Looks like Eddie did for Patchell. Mike Brown had a blinder! That will upset Opti! England went to sleep in the 2nd half again and that should concern Eddie a lot. Good win and Wales a tad unlucky I thought. I think the last 20 were closer than they needed to be; and it think it came from the halfbacks. Anscomb was a clear step up on Patchell, whilst Ford came off about 30s before Farrell lost his legs/lungs. Care on the other hand, had also run himself out, but a knackered Care with 65 minutes of rugby in his legs was still a massive step up on a fresh Wigglesworth. That was absolutely top drawer from Underhill. England weren't great but Garces didn't help the game at all. Eddie really needs to accept he's made an error in not looking at any SHs and bring in someone to get the experience required. Yep Garland having a big moan about the disallowed try in an interview, probably over stepping the line. Eddie wouldn't say that if he was in that position, he would have said ' hey, look, we had the rest of the game to get a win'. Brain dead and inept 2nd half performance by England. Very lucky to win. Wales only looked like scoring twice - the disallowed try and then the Underhill tackle. I think had Garces applied his breakdown interpretation to Wales as well as England it wouldn't have been close. Brown did what he is usually good at - collecting high balls, but he still never thinks to pass. Farrell should have had MotM. I don't see anything that Brown can do that Nowell can't. I never mind being right Shipwrecked! Except I didn't think he was that great. He stood out for England because it was such a scrappy game and he took his catches. But that's a bit self-fulfilling. It might not have descended into a scrap if Brown had an ounce of pace, vision, or footballing ability. Some of Wales' kicking was pretty sho1te - Ant or Daly might have had a field day. I agree entirely with Johnny Wilkinson. We need to score points. I think after that spell, and i know I thought it, we thought it might be one of those days. To their credit, it wasn't and a more potent attack and Wales would be winners. What concerns is that the two phases felt disconnected. May and Nowell were great going forward but bad in defence (May hovers to far forward - usually the mark of an uncomfortable tackler - and Nowell isn't quick enough to leave so much room outside). Likewise, Simmonds. For all his carrying (and it's good he targets the weak shoulder), his tight game was bad. But then players like JJ excelled in defence but couldn't provide a spark and Teo needs to work on his tackling technique. Yes, I might have exaggerated Brown's performance a bit for effect, either his positioning was brilliant of Eddie did a number on Patchel. 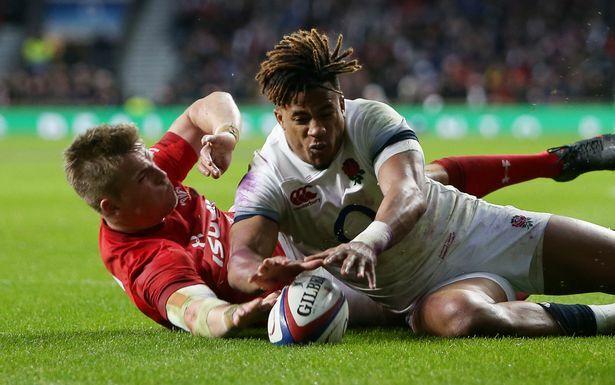 For the first time Eddie now has to lift this side, we didn't win a lot in the loose and Lawes has now been stripped of the ball twice at vital times in Wales England games. I've watched the Underhill tackle a couple of times now and how he flipped him on his back is amazing and very clever, if only he could learn to win turnover ball like Francois. I found it interesting the number of times JJ ended up tackling Patchell, how does that happen that a 13 tackles a 10 so often. Good photo in here if the disallowed try, only a freeze frame, but suggestive. Looks to me like the tmo got it right, not what I thought at the time. His he's not holding the ball, so downward pressure is required, it's at the side so no downward pressure. Certainly not as clear cut as I first thought. That is a good photo Dan so what actually is the law then? I agree, though I did notice that after being drawn into a ruck he often defended as the first man. I guess it saves him tracking across and covers for Ford. 2) By pressing down on it with a hand or hands, arm or arms, or the front of the player’s body from waist to neck. I can't say he's holding the ball and, implicit in part 2, contact is not considered holding it. Is he pressing down? There's at least doubt. The Te'o experiment looked unconvincing. Te'o has done nothing for me so far and Farrell looked out of ideas at 10. Gave away a penalty that could have been costly. Te'o looks better starting, smashing it up the middle and aggressive in the tackle. He reads the attack very well tbf. Coming off the bench he doesn't seem to add much apart from tiring out a team that will already be tired to some extent. Strange as a year ago he was a bit of an offload specialist who was aggressive in all the right ways. Hope for his sake he returns to that style of play asap. On that basis he is not pressing down on it with a hand, fingers at best, so good spot. England were very lucky to win that game. Even though they say it is a sign of a good side to win when playing badly, we squeezed a win by 2 bits if Farrell inspired play, and never really threatened the Welsh by back play and managed to break down their defence. England looked knackered and if they had to play another 5 minutes they would have lost as the Welch are fitter than us. Also their handling and passing through out their team was/is infinitely better than the English can muster. EJ is delusional if he thinks we can win the World Cup with performances like that. The AB's would hammer us. Farrell IMO was the outstanding player and apart from his passing and vision setting up the tries, his tackljng and covering was absolutely first class. May's defence is dreadful and apart from Launchbury and occasionally Lawes and Underhill, we were outplayed up front. I wish Shindler had an English parent as he is an absolute star performer. What do people think about Vunipola's scrummaging and also Cole's whose replacement Williams looked much more comfortable and contributed much more as well? Well the circus goes on with probable 2/3 week or longer injuries to Watson and Simmonds. Who's Underhill's adoptive forumite this year? See your quick question thread but it is Plong I think.